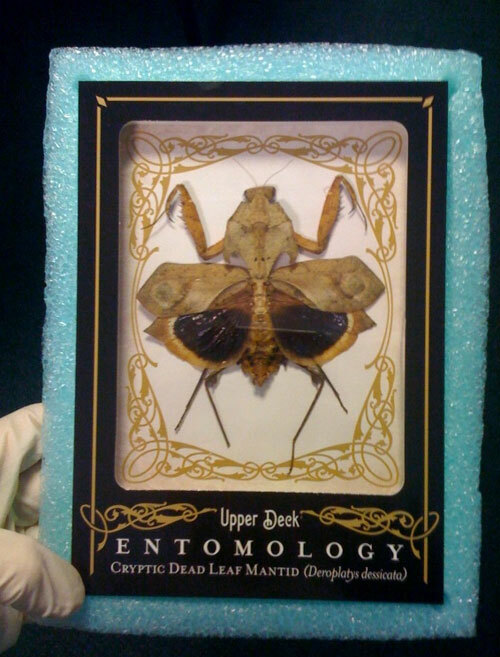 We’re excited to show the recently arrived Goodwin Champions Entomology cards. They’re one of the key pieces that define the Goodwin Champions brand in that they dramatically display the concept of taking a tobacco-era card, and rebuilding it with today’s technology to stretch the boundaries of what can be done with trading cards. Understandably, one of the questions we consistently receive about Goodwin Champions is why on earth did we make “bug” cards for a baseball product? It’s an obvious question and it deserves a proper response. As most collectors know, baseball cards were just one small fraction of the subject matter featured on tobacco-era trading cards. Dating as far back as the 1880’s, tobacco cards featured an array of topics including horses, flags, actors and actresses, political figures, famous landmarks and even butterflies. When we constructed Goodwin Champions, we really wanted to draw upon as many of these treasured vintage themes as possible. The primary goals of Goodwin Champions were to make a beautiful base set featuring artwork reminiscent of the classic 1888 Goodwin Champions set, make some killer hard-signed cards, deliver value and an enjoyable collecting experience in every box. We also, however, wanted to push the envelope in regards to what we could deliver in the form of a trading card and create some “I can’t believe they made that!” type-of-cards – whether it was getting our hands on some coal from the Titanic, a hunk of cable from the Golden Gate Bridge, strands of hair from Smarty Jones or a treasure trove of the world’s most fascinating creepy crawlies. The Entomology set was originally conceived as a collection of cards exclusively featuring butterflies – staying true to the history of the tobacco cards. In the process of researching the butterflies that would be best suited for our project, we discovered an array of insects that were just too good to pass up on. When you see a four inch long insect that look exactly like green leaf with legs and a head, how do you say “no” to making a card for it? After twenty years of making trading cards, we know it takes a lot to make collectors stop in their tracks and look twice. With its turn-of-the-century content, the Goodwin Champions product provided the ideal setting to make some truly unique relic cards, and that is why “bug” cards appear in a baseball product. Want to see more Entomology cards? Click here to visit our Facebook page, where we’re posting exclusive images! Brag Photo: Keep Goodwin Champions Weird! When will these cards ship? I have been anxiously awaiting mine for 6 months now. Thanks. We are hopeful to get in our completed inventory by the end of the month. The initial cards we received in were the completed samples, but they are still being completed now. You should begin to see these hitting the market in the coming weeks.